While people in the West are beginning to realise how important it will be to know Chinese over the next fifty years, young people in China are rushing to learn English, and innovative teachers are looking for ways to help them. In a few corners of China groups of teachers and academics think immersion will have an important part to play. One such city is Xian in Western China, former starting point of the Silk Road, home of the famous terracotta warriors, and capital city of China during the Tang Dynasty. English Immersion in Xian began in 1997. Qiang Haiyan, then a professor working in Shaanxi Normal University, and some colleagues initiated an English immersion project involving six different public kindergartens. They wanted to provide an English language learning experience for young children that focused on the natural use of spoken English within the classroom – very different from anything else available at the time. During that first year the children made such great progress in speaking and listening to English that a small number of primary schools in the same city introduced immersion in the following year. Over the next few years, members of the initial project team carried the idea of immersion to new jobs in other cities. Soon Beijing, Wuhan, Guangzhou and Shanghai had immersion kindergartens. Professor Qiang’s motivation came from her realisation that school pupils were not learning a great deal of English from their heavily grammar-dominated lessons. In particular, they were leaving school with low levels of fluency as they had little chance to learn or practise spoken English. In her words, “English teaching in Chinese schools has long been very inefficient. There is an urgent need for the reform of English teaching.” The project was inspired by Professor Qiang’s work with Canadian academics who had introduced the concept of immersion with Chinese minority groups through a Canadian International Development Agency project. It was, therefore, the Canadian model which the Xian project developed into the China-Canada-US Collaborative English Immersion Program. Table 1 below shows how much the project has grown over the past nine years, with regular support (including English immersion curriculum development) from visiting Canadian and American scholars and a dedicated project team in China. Some years ago Professor Qiang took up a new post in South China Normal University in Guangzhou in Southern China, where she has extended the project by introducing immersion into schools in Guangdong, Hubei, Fujian and Zhejiang provinces. English immersion education is proving to be a strong attraction for Chinese parents who are anxious to help their children compete in a demanding education and career marketplace. They see the benefit of starting English instruction early, in a way that is enjoyable and that will equip their children to use rather than just know the language. The same incentives hold true for schools and, as a result, most of the participating schools are encouraged by the prospect of offering an innovative programme of English language learning for their students. Elementary schools participating in the project teach about 50% of the day in English. The most important exclusions in the immersion curriculum are mathematics, which is always taught through Chinese and, of course, Chinese language. The debate in other early immersion contexts about whether and when to introduce the first language is not at issue here. Apart from the national requirement to teach Chinese, the demands of learning a character-based writing system are such that it is essential to start at an early age. In Middle Schools, from Grade 7, one subject is chosen in each school for continuation of the English immersion experience. The subject must be outside the prescribed national curriculum for this grade level but forms part of the school-based curriculum. For example, one school has chosen social studies, another has chosen science. 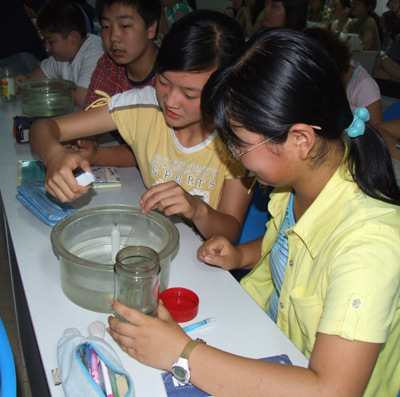 Kelly He’s students conduct an experiment during an English immersion science lesson at a Xian middle school. The challenges faced by immersion teachers in Xian are, at least on the face of it, unlike those in most North American schools. There are usually fifty to sixty children in a class. The teachers often have very little in the way of published teaching resources though they are active in producing their own materials. Nevertheless, a classroom visitor will observe hugely enthusiastic children involved in a great deal of constructive language learning. Teachers are very energetic, although by American standards, instruction is heavily teacher-centred. Pupils do a lot of choral work, sing songs together, repeat phrases, verses, and short dialogues with the teacher or with a partner. The teachers use a variety of visual stimuli and the pace is fast, with the children— heads-up and fully engaged. The teachers are obviously committed to their role despite the tremendous workload. They face many of the same issues that would be recognisable to immersion teachers everywhere. They must produce a lot of their own teaching materials, they rely on the support of a committed school principal, and they have to carefully communicate with parents to explain the aims of immersion, the advantages of learning a language in an immersion setting, and the ways they can help their children face the challenges of learning a new language. The schools and teachers are supported by a small team of dedicated academics led by Professor Qiang in Guangzhou and Dr. Chi in Xian. In addition to running a research programme, the project leaders locate schools which would like to offer immersion classes, help school principals identify potential immersion teachers and run workshops for new and experienced immersion teachers. They also organise occasional conferences at which teachers and academics from many parts of China, Hong Kong and North America can share experiences and findings relating to immersion in China and beyond. The most recent took place in Guangzhou in December 2006. It is important that immersion in Xian should be judged on its own terms. While part of its inspiration might come from North America, its origins and rationale are grounded firmly in China. To those used to Western classrooms it might lack some of the emphasis on free, purposeful communication which would be familiar in North American elementary schools. It is, nonetheless, intended to give children the chance to acquire and use English in a more natural environment, very different from what has been typical in most classrooms in China. It appears to be succeeding in that aim. There is no doubt that children passing through the immersion project have the chance to achieve levels of spoken English that they would never have achieved without it. Their English is also greatly enriched by the varied content they meet in their lessons and by the tremendous enthusiasm and commitment of their teachers, who are well aware that they are trying to implement something profoundly different in Chinese schools. Education in China is changing fast, and it is hard to predict what directions it will take. As Professor Qiang says, however, “English is very important for the educational and career opportunities of Chinese young people,” and that is unlikely to change. As schools, teachers, and parents look for different ways of enhancing English learning, the lessons learnt from the immersion project in Xian and Guangzhou may become significant across China as a whole.